We have many varieties of Bananas and Plantains. They are shipped in a 3 gallon size container. Bananas are a fast growing tropical plant so feed them well once you get them to your home. Our dwarf varieties will fruit quicker and are suited for growing in a pot. The Cavendish is the most common of the varieties and the most popular. All members of the Cavendish group are grown commercially and comprise most of the bananas imported into the United States today. They are easily grown on a wide range of soils. The only difference between the Cavendish and the Dwarf Cavendish is their tree size. They all have a mild, sweet, pleasant flavor. DC - DWARF CAVENDISH - The name 'Dwarf Cavendish' is in reference to the height of the pseudostem, not the fruit. The fruit is slightly smaller than grocery store commercial bananas. Will fruit at 4-7'. Wind resistant due to the plant's short stature. Cold tolerant and will withstand temperatures down to frost. Produces large heads of fruit that should be propped up. The fruit is very sweet. Resistant to Panama Disease but susceptible to attack by the banana corn borer and nematodes. Musa Double Mahoi is a Dwarf Banana plant that only grows 5 to 6 feet tall. A very rare and unusual plant that produces two large heads of fruit on the same plant. Fruit is very tasty and sweet considered AAA+. Double (Mahoi) is a Dwarf Cavendish mutation. Mahoi means twins in Hawaiian. Makes a great house or container patio plant. The stem is sturdy and the overall appearance of the plant is very strong. Great disease resistance Zones 8 and up great wind resistant. GN - GRAN NAINE - Mutant of the original Cavendish. Will fruit at about 8 - 10 feet. It produces large heads of fruit that is sweet and delicious. Margin of red on the leaves. Resistant to Panama Disease but susceptible to attack by banana corn borer and nematodes. IC - ICE CREAM - Tall plant, 16 -18 feet when well raised. The skin of the fruit is an unusual greenish-silver blue color when unripe but turns to a light yellow color when ripe. The pulp is snow white. Taste is delicious, very sweet with just enough acidity to offset the sweetness and make an interesting taste. Vigorous grower and produces heads of fruit as large as 50 pounds. Adaptable to most soils and is quite cold hardy. 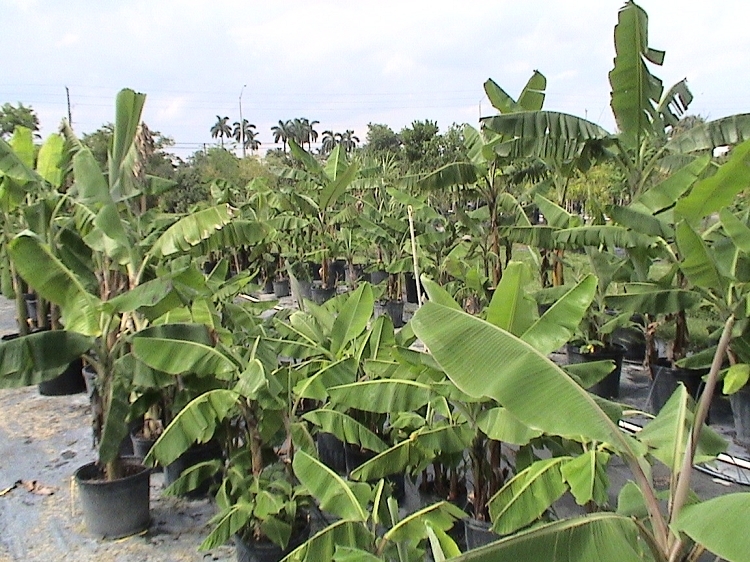 Resistant to Panama Disease but susceptible to attack by banana corm borer and nematodes. PC - PISANG CEYLON (an improvement on 'Mysore') may very well be the best tasting lady finger banana in the world. This sturdy banana is resistant to the Banana Streak Virus. 'Pisang Ceylon', has a shelf life that out last other lady finger banana types by several days. Height of 12-14'. DB - DWARF BRAZILIAN - This is very similar to the larger 'Brazilian' but much shorter. Its sweet bananas are also smaller than that of the 'Brazilian'. Its smaller stature makes it more suited to small gardens, greenhouses and large containers. It fruits between 7.5 ft to 9 ft. It has a strong thick pseudo stem and a strong root system. Leaves are medium in length and will reach mature sizes of 1 meter. Leaves tend to be quite leathery and tough. It has shown good wind tolerance in storms up to 50mph. It has a tendency to hold its leaves tight with short petioles. The color ranges from Kelly green to a nice deep Forest green. Fruit quality is considered one of the best. It is cold tolerant, and resistant to all diseases. Fruit will ripen on the plant without splitting. One can harvest by shaking the plant and having the ripe bananas fall down. The male flower is quite tasty when cooked and eaten in a salad. DNW - DWARF NAM WAH - Also known as 'Pisang Awak' and other names throughout the world. This group of lady finger bananas produce large sized bunches of sweet delicious fruit that is prized in the indonesian areas as well as the U.S. Somewhat sensitive to Panama Disease(fusarium wilt) The underside of a young leave is reddish-brown, turning green with maturation. PH - Praying Hands - Very collectible dessert banana. Perhaps the most unusual and distinctive of all banana fruits. Two adjacent hands of bananas are fused, giving the appearance of praying hands. The fruits are delicious. When totally ripe, individual bananas can be carefully separated from each other. Another way of serving: cut across the “hands” and eat with spoon. Mature Height 12-14'. HM - HUA MOA This plantain grows to 14 feet tall. The most unusual feature about the Hua Moa is its very fat fruit. It is widely grown in South Florida and very popular among the Cuban community. It actually falls in between plantain and a banana. Its texture has no fiber at all and the effect when fried is just delicious. They are also very good baked either ripe or green. The Hua Moa is somewhat cold sensitive. The fruit must be harvested before it ripens on the plants or it will split before turning yellow. It is resistant to Panama Disease but are susceptible to attacked by nematodes and corm borers.